Day 1258 - So long July - So Long work week! 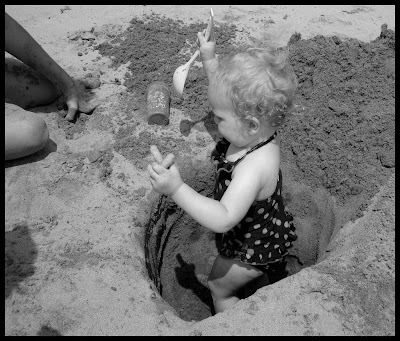 Here is Miss Savi, spooning some sand at the beach. I want to go! Have a nice 'day 2' at work, Heather, then you get the weekend to recover! This is the last day of July, folks - time to pay the bills! Where has the summer gone this year? Schools are starting here in the next couple weeks. School shopping is always a big event - and I'm glad I don't have to participate! School clothes and school supplies can put a dent in the summer budget, for sure. Hey - any locals out there - when is Tax Free weekend? I might be tempted to shop a little. Have a happy 'Back to work' day, Heather! I'll bet you're rushing around this morning for sure! 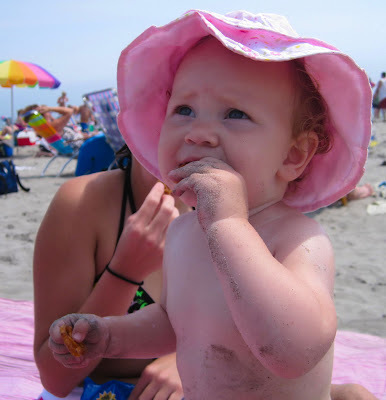 Here's a beach photo of the cutest girl ever, Miss Savannah, eating sandy pretzels. 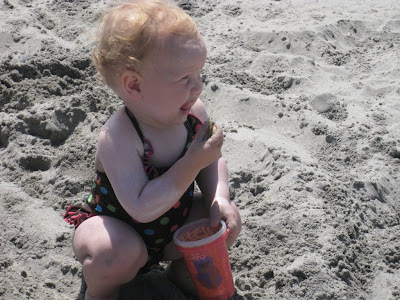 She must be getting used to eating sand. Well, I am running late, and also need to go to WORK. There is nothing middlin' about this picture, it is adorable! What would we do without your photography, Heather?? Keep snapping! Someone at work told me they were behind someone earlier this week who was doing their entire 'getting ready for work' routine while they were driving. Confession - I have been known myself to put on eye makeup while driving, but it takes me approximately 30 seconds to do it. Gotta go! TTFN and I love the new pictures, Heather! Congratulations to Heather for a successful job interview! Go, Heather! 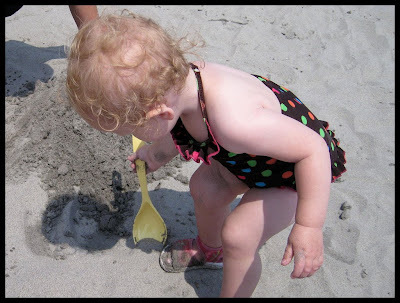 Here's a cute beach photo of Savannah sharing some sand, or reaching for something, or ?? I just love her balance and the way she braces her little feet! Adorable! I can't remember the last time I made sandcastles, I'd better put that on my to-do list for August. Speaking of to-do - I went to see 'The Ugly Truth' last night after work with a couple girls I work with. It's a chick flick, but mildly funny. The reviews weren't very good, but we enjoyed it. I still want to see 'The Proposal'. What? Nobody has a comment about putting swimsuits in the freezer? And Mom, yes, I've got a suit or two for you too! I'll bring them in August unless you need me to mail them to you sooner. Just let me know. Day 1254 - Monday and what to wear? I did, and paid for it by oversleeping by half an hour this morning. First off - Savannah looks (to me!) 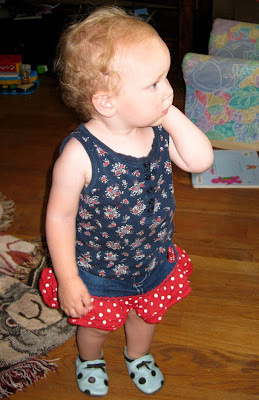 like she's not quite sure about this outfit she has on. There are a lot of colors and patterns going on there at the same time. That was my 'Monday blog inspiration'. I have a huge closet full of clothes, and sometimes can't DECIDE what combination of things to wear. Too many choices I guess. The other clothing story I have - one of my water aerobics instructors used to swim on a swim team. Her mother would store her surplus swimsuits in the FREEZER to prevent dry rot. Have you EVER heard of anyone else doing that, and does it work?? Inquiring swimmers want to know! Gotta go - TTFN and have a nice Monday! Day 1253 - Sunday and more rain! We had thunderstorms overnight and this morning, and a very short power failure. 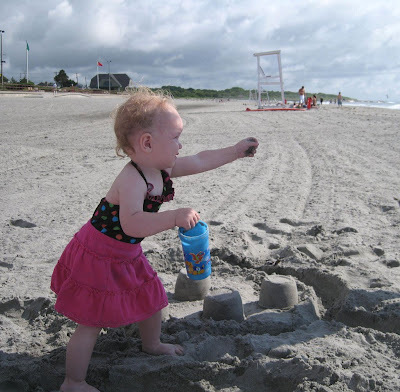 I can't get enough of these photos of Savannah at the beach. 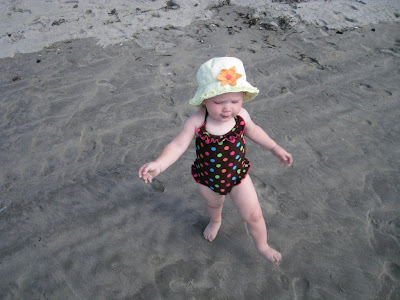 I love to see her 'in motion', and gripping the sand with her little, adorable toes! One sec - I have to go change over my wash to the dryer... Free product plug - I tried the 'Bounce Free' dryer sheets and I like them. They are unscented, they don't irritate my skin and make me itch, and best of all - they stay intact. My last box of (walmart brand I think) dryer sheets would shred and get stuck on little rhinestones and beads on some of my clothes. What's that? You say YOU don't wear clothes with rhinestones and beads on them? Well, I do. It's a 60's thing. Don't worry - I have plenty more. The ones I wore yesterday have blue beads on the bottom cuff AND every other one has a rhinestone on it. My water aerobics instructor said she loves my clothes. I've only seen her in swimsuits, so I don't know what her clothes look like! Yes, I've made coffee this morning, unloaded the dishwasher, and am halfway through a laundry cycle of sheets, towels, and 'unmentionables'. If the thunderstorms have left the area, I will head out for a swim before Charlie gets home around lunchtime. Savannah is 'bracing' for the surf, and looks like a little surfer du-dette. This is going to be short because I need to get ready for water aerobics. I've made the bed, made coffee, unloaded the dishwasher, swept the kitchen floor, made a gallon of tea-mix, and taken out some stuff to put in the car. I'm tired already! Just kidding. Charlie returns tomorrow morning, so I'd better go to the dump today so he won't have to on Monday. Gotta go! Have a nice Saturday! Day 1251 - Friday, Hooray! 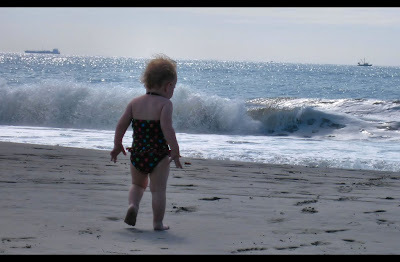 Here is a great photo of Miss Savi, strolling down the beach toward the waters edge. The sparkling water and the waves make me miss the beach! I can just hear the sounds and hiss of the tide, and hear the seagulls, and smell the salty, seaweedy, briny scents of the ocean. I was leaving Wal-mart yesterday, and was shocked to see one of the local news anchormen there! He had a ratty old T-shirt on and shorts, and looked like he was making a run for garden supplies or hardware or something. I made eye contact, gasped, and then walked on, not to make a big deal about it. I thought that was really funny - not only do they keep up with celebrity visits, but know which DOOR they use. That reminds me though, with all the stars in Nashville, many doctor/dentist offices have 'special' doors for the celebrities to use so they aren't sitting in the waiting room with the riff-raff like me. Ha! 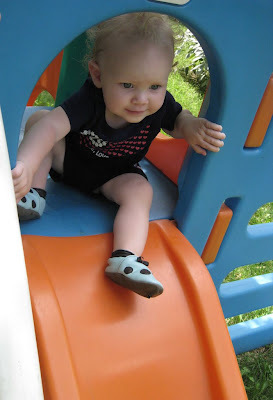 Here is Little Miss Adorable, sliding down the slide. She looks so thrilled with her jungle gym! Is that what you call it? 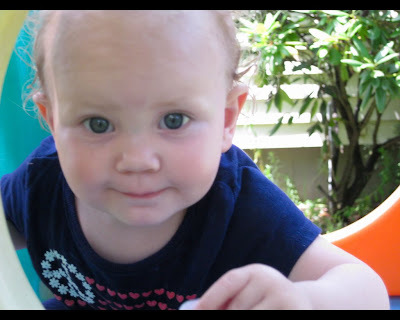 She looks like a little elf, and you know how I love elves! I am running a bit late this morning, so this will be short. Charlie is out of town for a few days, visiting his family in Iowa. That means I have to make the coffee, load and empty the dishwasher, get the newspaper and mail, take out the trash, and make the bed all by myself. Anyway - have a nice Thursday, and TTFN! 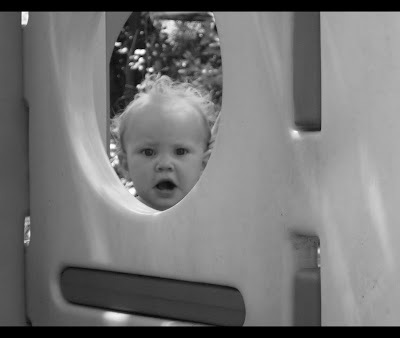 Here's a cute closeup of Savannah, peeking through a porthole in her play area. We are actually getting some gentle, morning RAIN! I can't remember when we last had rain in the morning. I'm sure the FAM in New England can't imagine what 'no rain' is like. Instead of my foame' latte' this morning, I am having Mocha-latte' - coffee with hot chocolate in it. I frothed it with my milk frother (thanks, Cheryl - we have used this for years!) but it doesn't really froth. Speaking of coffee - a lot of coffee and other places are offering free stuff, I imagine their business is slipping due to the economy. Starbucks had a promotion for a free pastry, McDonalds has one every Monday (or something like that) for a free coffee drink, even Chick-fil-a had coupons out at my work for a free chicken biscuit (if you bought a drink and home fries). No, I didn't take advantage of any of those but I wonder if a lot of people ONLY turn out for the free stuff and never go back... I would think so. Well, I guess that ends my 'morning musing' session. I had a nice Monday, and left at 2pm because I had worked yesterday. 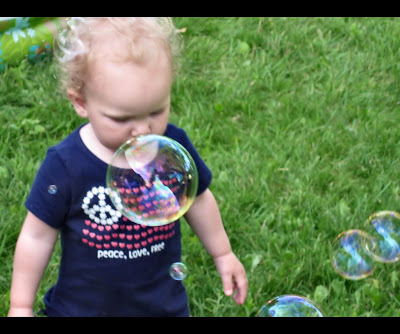 Here's a cute photo of Savannah amidst the bubbles. Although, not meaning to be indelicate - it rather looks like that big bubble came out of her nose. I keep forgetting to tell this story on the blog... PETA, look the other way. Do you ever swat a fly and then it won't DIE? My mother will swat a bug until there is nothing left, by the way... I guess that is where I learned that one swat is not enough. I prefer to vacuum bugs if I can. I hate it when a bug gets in the house, especially a fly or a bee. Recently, I 'cornered' a fly in the room we use for the computer and files and such. I swatted it once, but then I couldn't FIND it to pulverize it. Later that day, I felt something crawling on my FOOT, INSIDE MY SHOE! That darn fly had revived itself and crawled into one of the holes in my shoe, which is a sketchers cali gear sandal. I freaked out and squashed it inside my shoe, and then had to go scrub my shoe. I just needed to tell that. Here is the perfect Monday morning photo - Savi making a face from eating sand. I know just what that tastes like. Hilarious! I love this picture. Charlie can't believe the gray, granite-based sand in New England, he is spoiled to the pristine, sparkling white 'sugar sand' of the Florida Panhandle. We had a very nice day yesterday. However, after that I had some weekend job issues and ended up working for most of the rest of the day, into the evening, and even some overnight. Gotta run, and have a nice Monday! Day 1246 - Sunday and Harry Day! Church sign of the day 'A clean conscience is like a soft pillow'. This picture of Savannah makes me chuckle out loud. She is SO expressive, and the faces she makes are so great! Yes, Heather - you told me that you are planning to go to the beach every week. I am SOOOO jealous. You mentioned I used to go every Friday, and I did - weather permitting. I love the breeze, and the seagulls, and the wave noises, and just walking on the beach and hanging out. And the people watching! I like Fridays or Mondays the best, because there are less people (and traffic!) to contend with. We can go in September when I'm there if you want to! How much does it cost nowadays (or do you just pay to park? ), and can you get a resident sticker and go for free? I loved getting a Newport beach pass each year and hitting the beach as often as possible. Have a great Sunday! Charlie, Buddy Joe and I are going to see Harry Potter today! Day 1245 - Yay! Saturday! 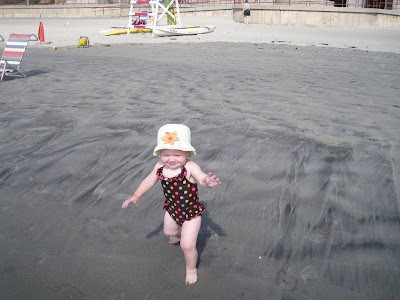 Here's one of my favorite photos of Savannah's first summertime beach visit. 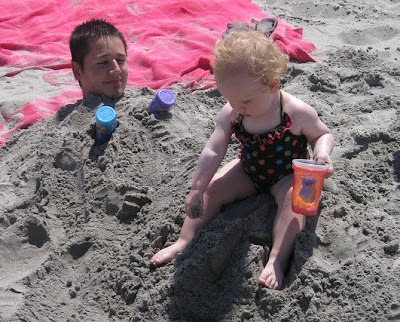 Savannah is perched on top of the 'sand buried' Anthony, playing in the sand! Gotta go - and have a nice Saturday! Savannah looks like a little tie dye froggie in this photo... TOO CUTE! Heather - have fun at the beach today! I would love to go to the beach, I have to wait another month to go. I hardly have any tan this year, in the spring it rained all the time, then it turned boiling hot - too hot to be out in the sun! Hey! Has anyone gone to see 'Harry Potter' yet? We are definitely going to go sometime this weekend, not quite sure when yet. It's after 6, I'd better go! TTFN, have a nice Friday and a great weekend! Day 1243 - Is it THURSDAY already? It's Thursday already - how did that happen? I'd better catch up! 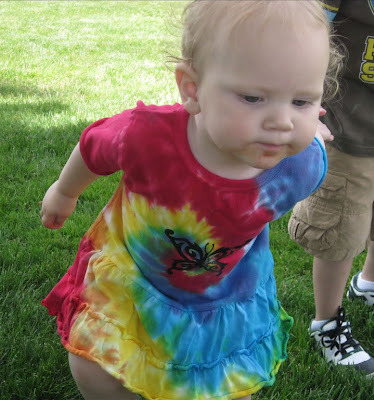 Miss Savannah is doing a little dance in the tie dye outfit given to her by Aunt Nancy. Awesome! Thanks, Aunt Nancy! Heather says other people at the park were asking where she got that outfit. They can go to San Francisco and get one, right? Well - what's going on where YOU are? Has it stopped raining in New England yet? We were happy to have even a little bit of rain overnight, though some areas of Tennessee got 6 inches of rain all at once in that storm. I had three eBay purchases arrive yesterday, so it felt like Christmas. I bought an oldies CD (Jay and the Americans), a new pair of blue Skechers (they are on my feet right now), and my fourth (of the same style) new Speedo swimsuit of the season! This swimsuit is a style and color that I love (black and purple), but it is not very chlorine or wear resistant. It will last about a month or month and a half, since I am in the pool 3-5 times a week. I have plenty of other swimsuits (aka stockpile), but that particular suit style is my current favorite. Now the trick is to find a swimsuit I like just as much that is made of polyester 'Speedo Endurance' fabric that doesn't bleach out or wear out. Those polyester Endurance suits are my second-favorite suits, and they LAST and LAST and LAST. I can leave them in a hot car and let them air dry and they don't disintegrate. I've got water aerobics tonight, actually if there aren't any thunderstorms! 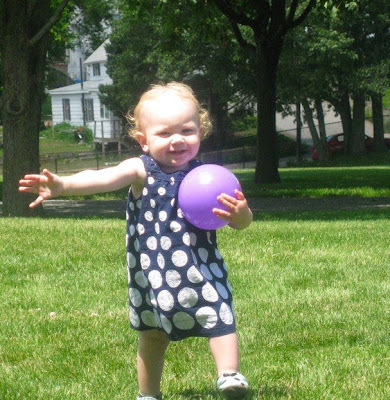 Here's a fabulous picture of our little miss Savi, running at the park and obviously having a great time. What a happy little face! That is making me chuckle out loud. She looks a little like a running back with the ball tucked under and her arm outstretched. Love the polka-dotted dress and shoes, Heather! Changing subjects to summertime- it is going by too fast! Can you believe that July is half over? Around here, school registration starts in 2 weeks, and school begins in August sometime. I am taking advantage of summertime produce though. Yesterday I bought a big cantaloupe for 99 cents, and a big watermelon for $2.99. I haven't cut up the watermelon yet, just the cantaloupe. Don't you hate picking out a watermelon (or any melon) and finding it is bland or not quite ripe? My 'system' is not foolproof - I look for yellow patches on the watermelon and a hollow sound to see if it's ripe, but that doesn't always work. I have no idea how to pick honeydew melons, so I usually don't bother to buy those! Well - I've gotta go, love that picture today, Heather! TTFN! 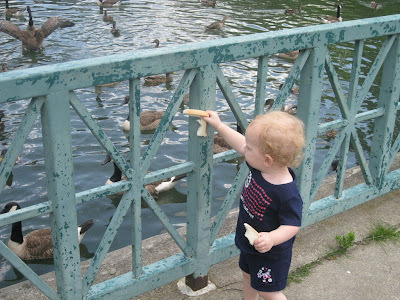 Here is TWO-fisted, bread toting Savi, trying to feed the ducks a little too soon. She doesn't know they can't reach up there through the gate. Great picture, Heather! I love bread, by the way, and I hear that Savi does too. When I was a kid, we'd always have a stack of bread on the table to have with dinner. I'd trade my dessert to have more bread and butter! We'd go out to a restaurant, and I'd fill up on the basket of bread at the table and didn't care much about my dinner. Charlie and I went out for Greek/Mediterranean food yesterday with TY and SY. I'll bet I ate 500 calories worth of warm pita bread dunked in cucumber sauce. I had the Mediterranean salad (like Greek salad but without the marinade - the dressing is on the side) with grilled chicken pieces on top. It had feta cheese, black olives, green pepper, onion, tomatoes, etc in it. Good stuff. Hey - I'd better hit the road - TTFN and have a nice Tuesday! Day 1240 - Happy Birthday Mike! This is going to be short because I have some work issues to chase. Happy Birthday to Mike today, and Happy Jury Duty to Heather. What fun! Hope you all have a nice monday, and TTFN. Day 1239 - Happy Birthday, Auntie Cheryl! It's Sunday - the weekend goes by too fast! Church sign of the day is 'Make people happy wherever you go, not whenever you go'. Happy Birthday to Auntie Cheryl today - here is a picture of Cheryl tickling Savannah at her birthday party - Savannah liked it! We had a nice day yesterday with Charlie's group. Little Clark fell asleep in my arms after playing on the floor happily in the 'baby safe zone' I made for him. 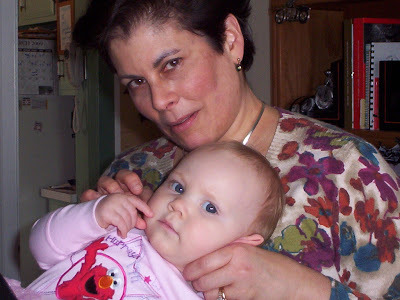 You see - I have this hypnosis-factor happen when I snuggle a baby, they crash! We had our BLT's and corn on the cob, and ice cream with whipped cream and nuts afterward. Today we're going to the health club to swim off some of yesterday's food, then we might go see 'Hangover' this afternoon. TTFN and have a great Sunday. Have a fun birthday, Cheryl, and Happy Birthday-Eve to Mike today! 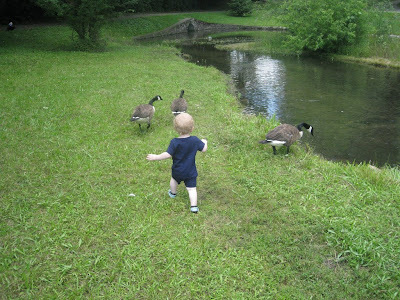 Here's Savi chasing after the geese. If she had FOOD in her hand, they'd be chasing HER! I'll be leaving for my 8am water aerobics class, and I'm happy that I made it this week to Tuesday night and Thursday night water aerobics. We'll have a fun afternoon. 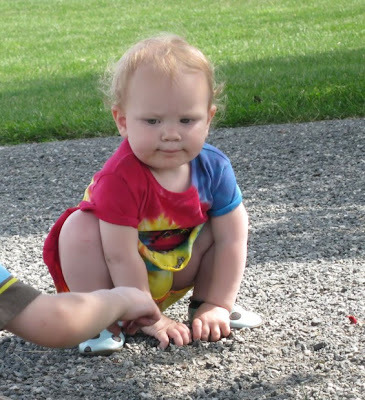 Charlie's daughter, son-in-law, and grandson Clark are coming over, and the baby just learned to crawl. That also means he is mobile and into everything! I am planning BLT's, chips n salsa, and corn on the cob for lunch, followed by butter pecan ice cream. I have made a 'barricaded' play area in the den for Clark. The play area is fenced in using 5 or 6 suitcases, laundry baskets, and pillows. I also put down a soft, flannel sheet so he won't get rug burn when he's crawling, and took out various toys that we have around the house. That reminds me to go take a picture of it. Gonna do that right now... Done. Day 1237 - Friday at home! Here's a cute shot of Savannah calling the geese at the park. And it worked! She puts her whole self into it - very similar to how she would call a puppy, right? I am working from home today, but got up early anyway because of an overnight issue with a job. That's okay, because I didn't have to 'get ready for work ' or commute this morning. I'm saving gas too today! I guess I'm doing my part for the environment. Have a nice day and a great weekend! TTFN! Day 1236 - Friday eve already? Greetings, Bloggy Waiting for the Week to End-ers! 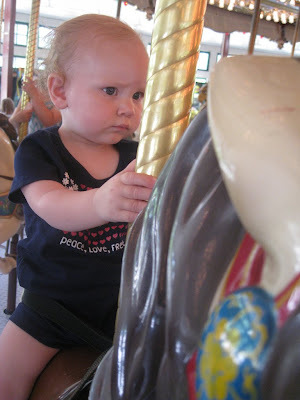 Here is a photo of Savannah looking skeptical of her ride on a carousel horse. Heather says she usually loves the carousel, so she must have been thinking about something else! I've probably mentioned this before, but very old carousels had a brass ring 'tube' that stuck out toward the riders. You had to lean way over and try to grab the brass ring when you went by (without falling off). If you were lucky enough to get one, you got a free ride. I think a ride used to be 10 cents at the Crescent Park carousel. It must be a New England thing, because people I've spoken to here have never seen one of those before. Well - gotta go! Have a nice Thursday! 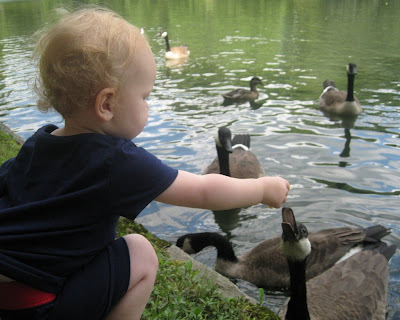 Here is a great photo of Savannah feeding some Canada geese. There is one lonely duck in the background. What you can't see is that Savi's shirt is firmly gripped in Heathers hand so she can lean over but won't dive right into the water with them! 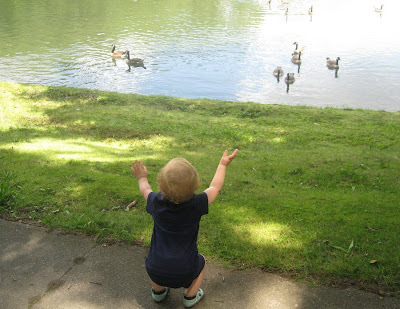 It is SO fun for children to feed the ducks - they get so excited over it! 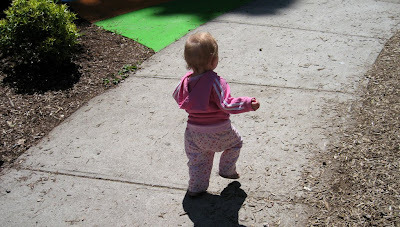 Here are 'two' - Savi and her shadow as she runs to the park. She looks a little saggy, baggy in the back-end region... Makes me laugh! So, what's going on? Monday is over, and it's all downhill from here till Friday. Did I tell you we went to see 'Transformers' on Sunday? It was only so-so, and extremely long (or maybe it felt extremely long because it was only so-so). Of course, a long movie meant we got to eat a lot of popcorn, but even that didn't make up for bad writing, unnecessary bad language, stereotypes and 'potty humor'. The best part of the movie was listening to the boy sitting behind us who was LIVING the action. He would gasp loudly when the 'hero' transformers were in danger. He would cheer at appropriate moments. He knew the NAMES of some of the transformer characters. Gotta go to work! TTFN and have a nice Tuesday! 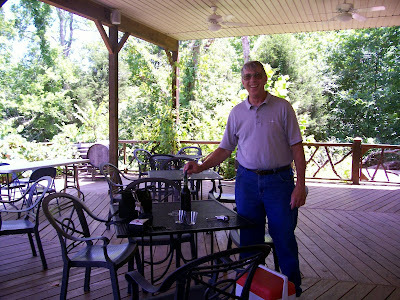 Here is a photo of Charlie on our Friday outing to the Keg Springs winery. As you can see - the porch was empty! We enjoyed the privacy very much. Charlie said something funny yesterday. I saw him smile and say something, but he wasn't talking to ME. Day 1232 - Sunday already! 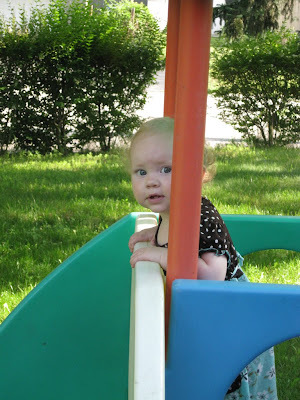 Today's photo is adorable - Miss Savannah peeking out from her play gym in the yard. Charlie and I are headed to the health club for a swim, then going to see an early showing of 'Transformers', then who knows? Have a nice remainder of the holiday weekend, and it's back to work tomorrow! Day 1231 - Independence Day! 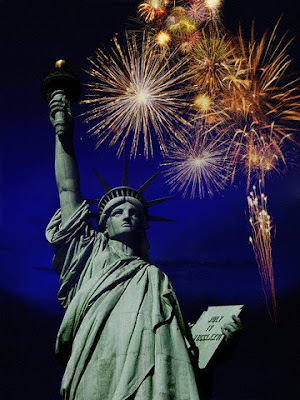 Greetings, Bloggy Americans, it's July 4th, Independence Day! Nashville has one of the biggest fireworks shows in the nation, as well as a free Wynona Judd concert beforehand. Festivities kick off around 3pm, but according to the news, there were already people camped out on the lawn at Riverfront park at 4:30am this morning. Charlie and I had a perfect day yesterday. We went to Cracker Barrel for breakfast (scrumptious! ), then back home for awhile. In the afternoon we took a drive out to our favorite winery, Keg Springs, and bought a bottle of wine, sat out on their porch and ate the food we brought with us. I was worried it would be crowded, and it was exactly the opposite. For most of the time we were there, we had the place to ourselves! Some nice bluesy/jazzy music played softly in the background. The porch was shady with overhead fans and grape vines growing along every railing. White lights were wrapped around poles. The birds chirped, and the tranquility was spectacular. Another couple arrived with some munchies and a deck of cards. They sat out on the deck and played cards. I noticed they bought the same wine we did - Crusade. Thanks to TY and SY for turning us on to the place! Today we're going to just run errands until the afternoon. We'll grill out later, but I need to hit the health club, the grocery store, make potato salad, etc. TTFN and have a Happy 4th of July! I heard yesterday that Uncle Ray's funeral was very well attended, overflowing the church. It was rainy, and I imagined that was the angels weeping on behalf of the family. We lost Ray a week ago today. 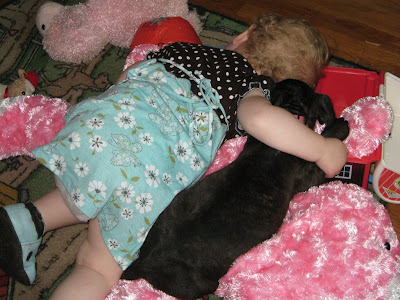 Today's photo is of Miss Savannah, relaxing, but with a firm grip on a puppy. Her head is resting on the Fisher Price farm that I sent her for her birthday (or was it Christmas?) Too cute! Well - we are having a phone outage here, so anyone trying to reach me will need to use my cell number. It took us about half an hour of googling to find the residential service number for the phone company, they don't include it on the bill anymore! When I called service, an automated message told me that a main phone line was down in our area, and that they expect it to be repaired by JULY SEVENTH. Hopefully sooner! Charlie and I are headed to Cracker Barrel for a holiday breakfast. Have a nice day today and a Happy 4th weekend! Here is a great photo of Uncle Ray and Aunt Mary Ann, taken in California among the redwood trees. Ray's funeral service is today. I hear that yesterday's visitation was attended by many, many people. I know that everyone loved Ray, he was just that kind of guy. He was open, friendly, hard working, funny, generous, and the kind of person it just feels good to be with. If you missed one of Heather's comments earlier in the week, she said that 'Stepping into their home is like getting a big hug'. I can't imagine a nicer sentiment or testimonial to the love Ray and Mary Ann shared with everyone and with each other. Thanks for being in our family, Ray. Rest well, and we'll be thinking of you until we meet again. Day 1228 - July is here! Greetings, and welcome to July! 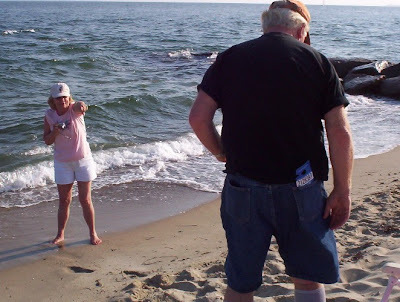 Today's photo is Aunt Nancy 'directing' Uncle Ray to stand on a particular spot of sand for a photo op at Cape Cod one July. I think this picture is hilarious, and hope Nancy does too! Ray participated in and enjoyed COUNTLESS get togethers, trips and photo shoots. The family has been on on cruises, trips to Hawaii and California and Cabo and Las Vegas and lots of other places. I remember when traveling, Ray always made sure to tell us that nothing could be better than being in Maine. The weather was better, the air was cleaner, the water was tastier, the beaches were sandier, and the views were more spectacular. You know why? Because Ray LOVED where he lived, and loved his home and family and his day to day activities. I can't argue with that! Love you, Ray!